YOUNG CHILDREN WILL GET A KICK OUT OF A CHAIR JUST THEIR SIZE. BEST USED FOR BIRTHDAY PARTIES, FAMILY REUNIONS AND DINNER PARTIES. FITS WELL AROUND OUR 4' PLASTIC TOP TABLE. LEGS ADJUST TO CREATE A KID HEIGHT TABLE (APPROXIMATELY 12" HIGH) TABLES CAN FIT 4-6 KIDS CHAIRS. 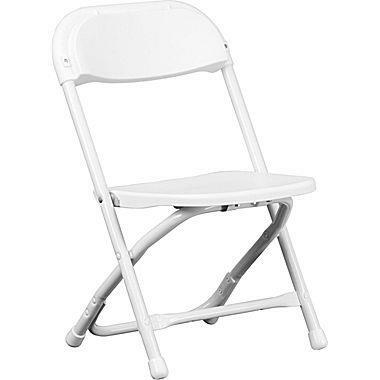 * Please call us with any questions about our kid chair folding white rental in Baltimore Metro area.